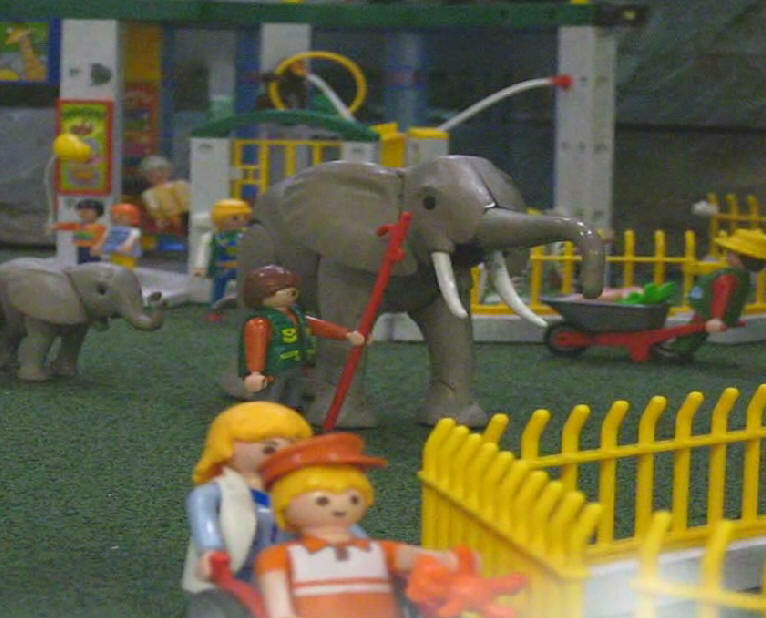 Objective: Design and construct an animation where a Playmobil elephant's head and trunk raise as the elephant trumpets loudly. In the two photos below you can clearly see the servo and the control wire that goes to the trunk. A small section from one of the servo's horns was glued into a hole in the bottom of the trunk to facilitate moving it. 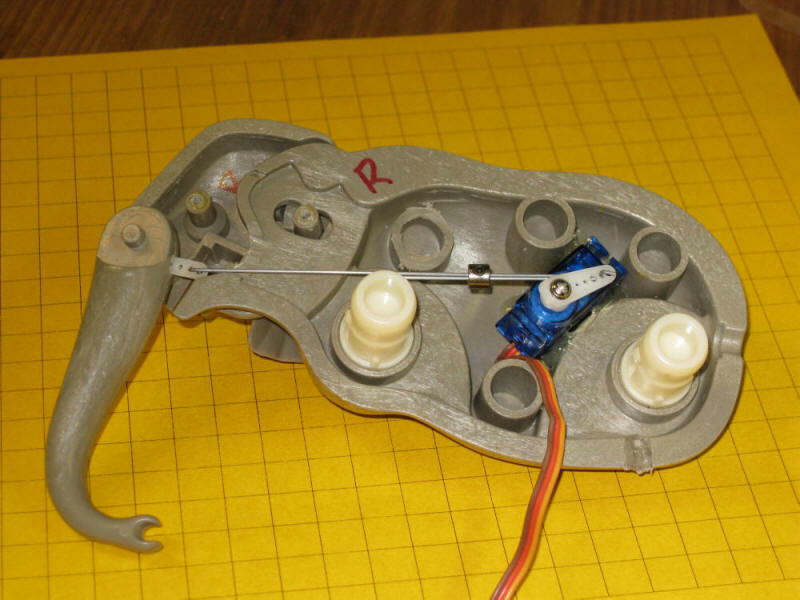 The servo itself was glued in with hot melt glue. This make removal and replacement easy. The servos have been lasting 4-6 months at Children's - not bad for such a small unit! In this photo you can see the section of a servo horn that was glued into a small hole that was cut into the bottom of the trunk with a Dremel. I drilled three very small holes side by side to get space to insert the piece of the horn then used epoxy to glue it in. The fitting in the center of the photo (Du-Bro part # 139) made adjusting the length of the control wires quite easy. You can also see that one of the internal posts (just above the fitting) was cut down to provide clearance for the wire. You can see here that some of the elephant's body was ground away (center of the photo) to allow the wire to exit. 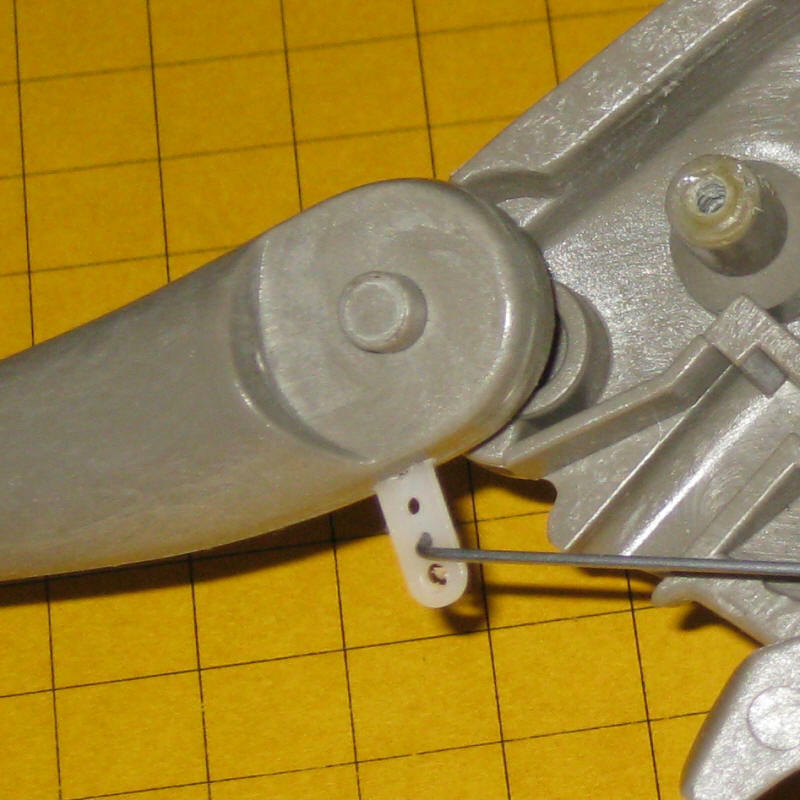 The larger elephant can be disassembled by removing two screws. One is located behind the left eye. Gently pry out the plastic plug that makes up the eye - the screw is behind it. The other screw is in a slot behind the left ear. The head comes apart easily. Pull the two left legs off or pry them off. Now the two halves of the body can be separated. The completed Elephant Animation Unit is shown here. The main circuit board is to the left. It has a connection (3 wire plug in upper right) that goes to the servo - note that the brown wire goes to the pin closest to the center of the board (marked -). The power connection goes to the red & black wires at the bottom. 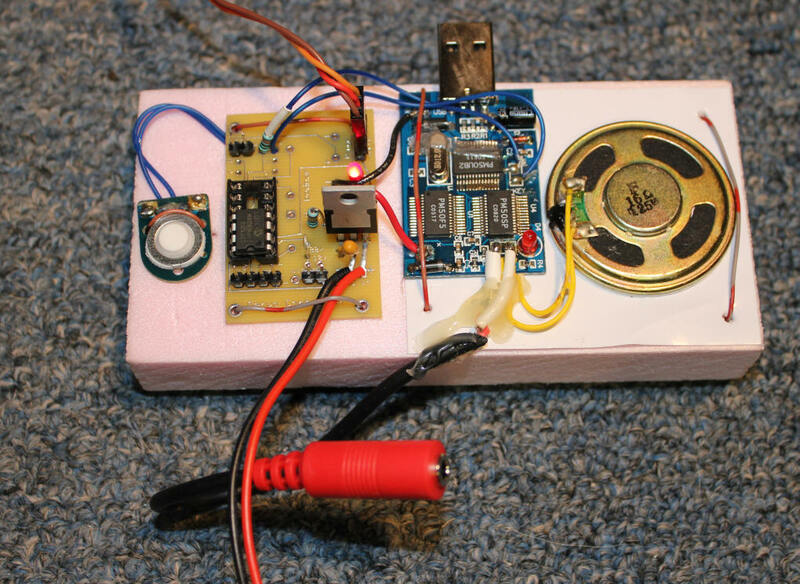 The sound unit is the blue board to the right. Speakers plug into the red receptacle at the bottom. The demo speaker is at the right. It is not needed and can be disconnected by cutting either or both of the yellow wires that go to it. The button at the far left is to start the unit. Another button can be connected by the two pins in the upper left corner of the board. 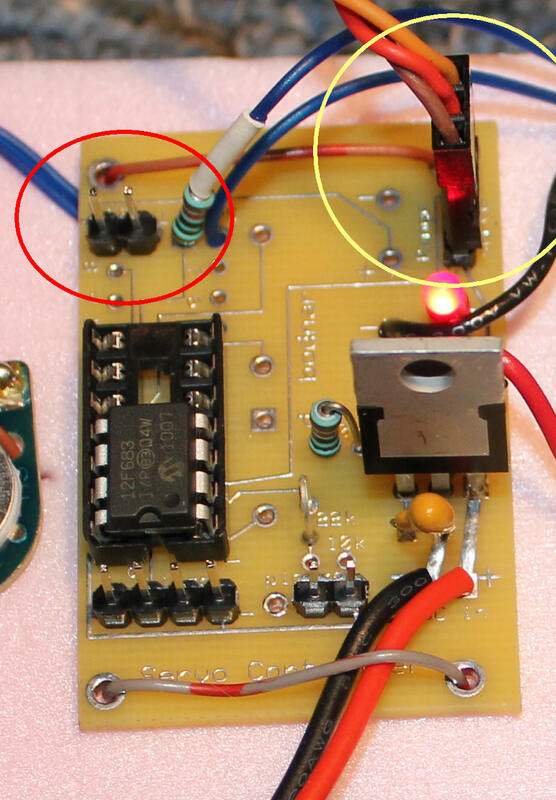 This close-up shows the pins for the external switch (red circle) and the connection for the servo (yellow circle) - orange wire at the top & brown wire at the bottom. The program for the animation is written for a PIC 12F683 processor. It is programmed in PIC Basic Pro - the listing is below.